Let's face it; many people just don't like snakes. Well, that's fine. I have no problem with people who dislike, or are afraid of snakes. However, I do have a problem with people who take this dislike or fear to the another level by killing the poor serpents. Remember, all snakes are harmless if left alone. It's when you attempt to kill, or accidentally startle a snake, that you're more likely to be bitten. Also remember that snakes are beneficial (especially the big ones). Large snakes (such as Fox Snakes, Black Rat Snakes and Bullsnakes) eat rodents, such as deer mice and pocket gophers. These are the same rodents that damage crops and spread disease (such as Lyme's Disease). In addition, many snakes are protected by law within Wisconsin. 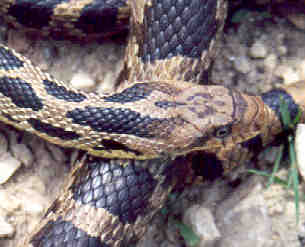 Harming protected snakes can result in fines of several hundred to several THOUSAND dollars. Therefore, purposefully killing a snake not only helps the spread of mammalian vermin, it's a downright silly thing to do. So what can people who fear snakes do? Check out some of these links below.